The new kids are in town. Half the award winners for 2018 are first-time winners. These five newbies join five repeat winners being recognized for their defensive excellence during the 2018 Major League Baseball season. Andrelton Simmons has more Fielding Bible Awards than all of the new faces put together. Simmons (SS) garnered his sixth consecutive Fielding Bible Award in 2018. Alex Gordon (LF) returns to the Best Defenders in Baseball club after a three-year hiatus with his fourth Fielding Bible Award. Mookie Betts (RF) and Javier Baez (Multi-Position) each gathered up his third in a row. Lorenzo Cain (CF) receives his second award after winning a Multi-Position award in 2014. The five first-time winners are Matt Olson (1B), Kolten Wong (2B), Matt Chapman (3B), Jeff Mathis (C) and Zack Greinke (P). 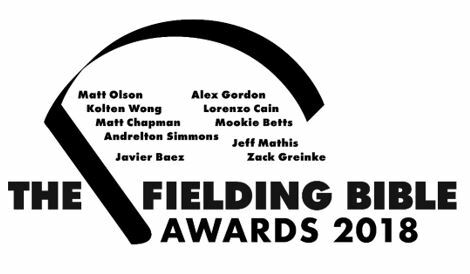 Two new panelists, Chris Singleton and Vince Gennaro, are now part of our 12-person expert voting panel who vote for the annual Fielding Bible Awards, now in its 13th year. They are the ones who stand up and say, "This is the best fielder at this position in the major leagues last season." The panel awards ten winners each year, one at each position plus an additional award that goes to the best defensive multi-position player. Here's a short refresher course on how the awards are determined: We asked our panel of twelve experts to rank 10 players at each position on a scale from one to ten. We then use a similar scoring technique to the Major League Baseball MVP voting. A first-place vote gets 10 points, second place 9 points, third place 8 points, etc. Total up the points for each player and the player with the most points wins the award. A perfect score is 120. A complete record of the voting can be found in The Bill James Handbook 2019.